Hyatt Place Denver Airport features an indoor pool and a fitness center. The hotel offers a coffee shop/café. A bar/lounge is on site where guests can unwind with a drink. A computer station is located on site and WiFi is complimentary. Event facilities measuring 1170 square feet (109 square meters) include conference space and meeting rooms. This business-friendly hotel also offers complimentary newspapers in the lobby, a 24-hour business center, and dry cleaning/laundry services. A roundtrip airport shuttle is complimentary to guests during limited hours. Hyatt Place Denver Airport is a smoke-free property. Hyatt Place Denver Airport is just off highway I-70 and a short drive from I-225 in Aurora, 12 miles (19.3 km) east of downtown Denver. Denver Airport is 15 minutes by free shuttle. The local area has a choice of good restaurants within walking distance. Guests can relax in the indoor pool, or head to the 24-hour fitness center for a workout. Starbucks Coffee® and cocktails are served in the bar. Spacious, smoke-free rooms come with free WiFi and MP3 docks, and guests can watch the HDTV from the comfort of the sleeper sofa or Hyatt Grand Bed® thanks to swiveling 42-inch screens. There are mini-fridges, coffeemakers, and wet bars for drinks, and bathrooms include KenetMD™ toiletries. Hyatt Place Denver Airport offers 126 air-conditioned accommodations with DVD players and safes. Accommodations offer separate sitting areas and include sofa beds. Beds feature down comforters and premium bedding. 42-inch flat-screen televisions come with pay movies. Guests can make use of the in-room refrigerators and coffee/tea makers. 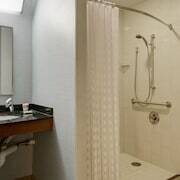 Bathrooms include shower/tub combinations, designer toiletries, and hair dryers. This Aurora hotel provides complimentary wireless Internet access. Business-friendly amenities include desks and phones. Additionally, rooms include irons/ironing boards and blackout drapes/curtains. Housekeeping is provided daily. Flights from John Wayne to Sky Harbor Intl.